Hi everyone! Are you ready for Father's Day? I put together this table in preparation for Father's Day. Hopefully, our weather will hold and we will be eating deckside this Father's Day! The big letter "L" is for my husband's last name that we all share. 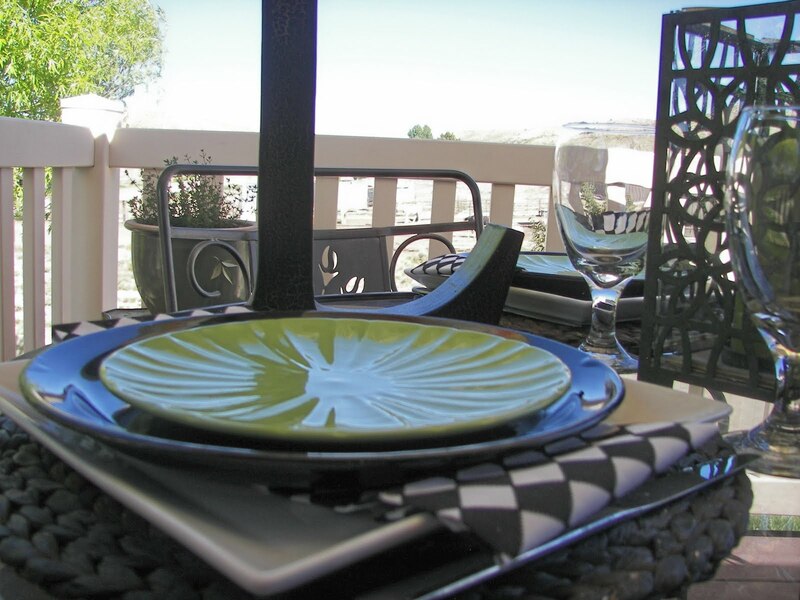 Come along deckside for this Father's Day Tablescape. We are celebrating Father's Day with "Lawnmower Cupcakes." Being outdoors and having a nice lawn has always meant a lot to my husband. I saw these cupcakes on Family Fun's website and knew that I would be making them for Father's Day. On the actual day, I will be making some homemade ice cream that my husband loves. He keeps asking me if I have put the ice cream recipe on my blog. I haven't posted it yet, but I will be posting it soon. This is a photo (pre-digital) of my husband and our son while mowing the lawn. Yes, my husband DID have a rope and was pulling Skyler on his "big wheel" as he mowed! In one home we lived in, my husband had a half acre lawn to mow. Some of the lawn was on a hill and it was quite a job to mow! The cupcakes were easy to make! 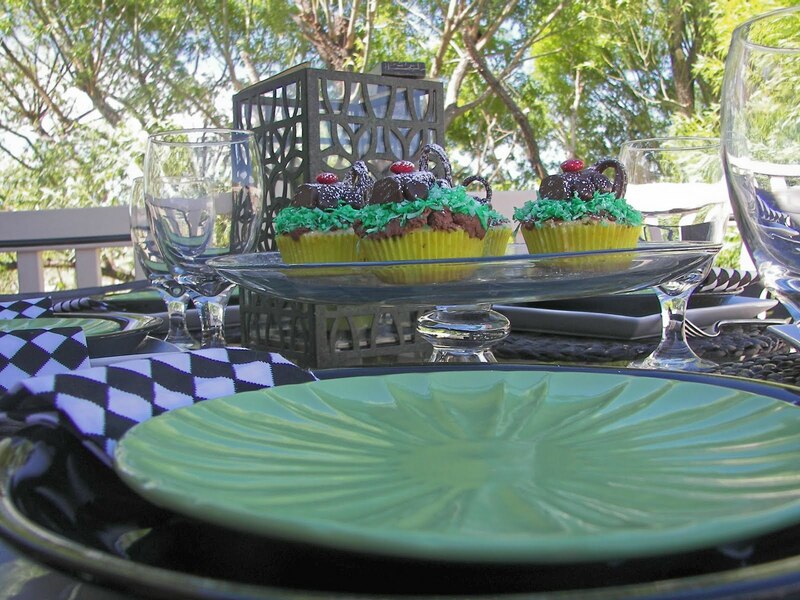 I love the black and white napkins with the black plates and the green salad/dessert plates. I think it makes a fun and hopefully manly combination! I scattered some M and M's on the plates for fun. I hope you have enjoyed our Father's Day Tablescape and that you enjoy time with your fathers, husbands, and father-in-laws this Father's Day! 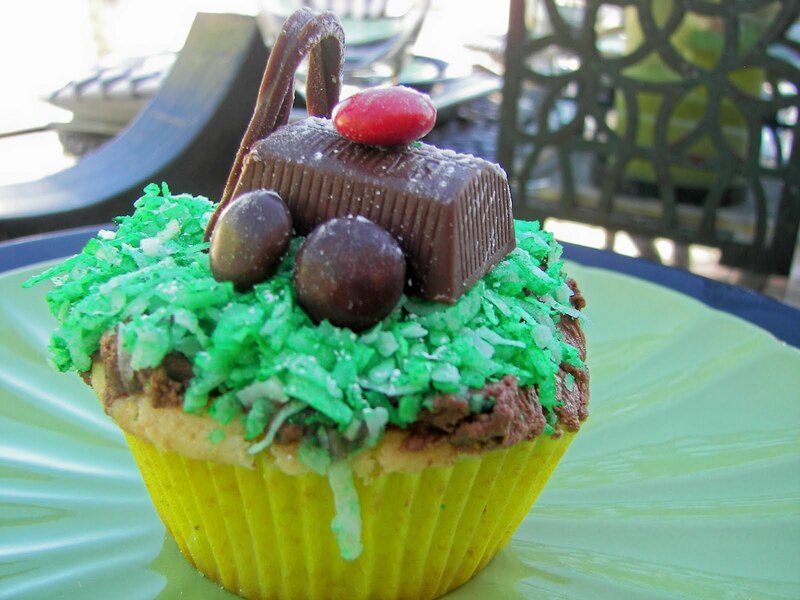 I love those little lawnmower cupcakes! I'm not sure what we'll do for dinner on Fathers' Day - I'll just get home the night before. Dinner will be something on the barbecue and dessert will be one of HIS favorites! GREAT cupcakes, Joni! 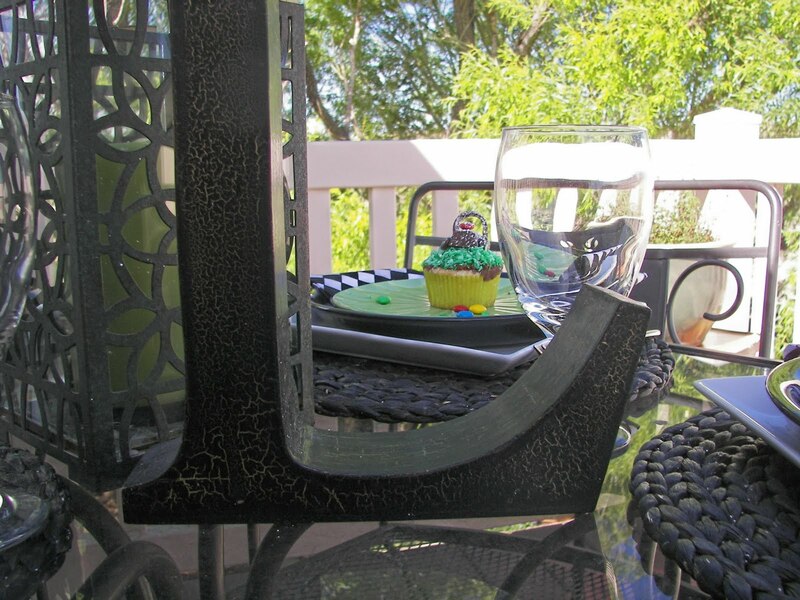 A nice tribute to your husband and I love your table! I love this table, very manly! The cupcakes are too cute. The photo of your husband pulling your child made me think of my Dad who made a little cart for the grandkids to ride in when he mowed the yard on the riding lawn mower...thanks for bringing back a memory. Joni, those cupcakes are darling! What a cute idea, and you've carried it out beautifully. 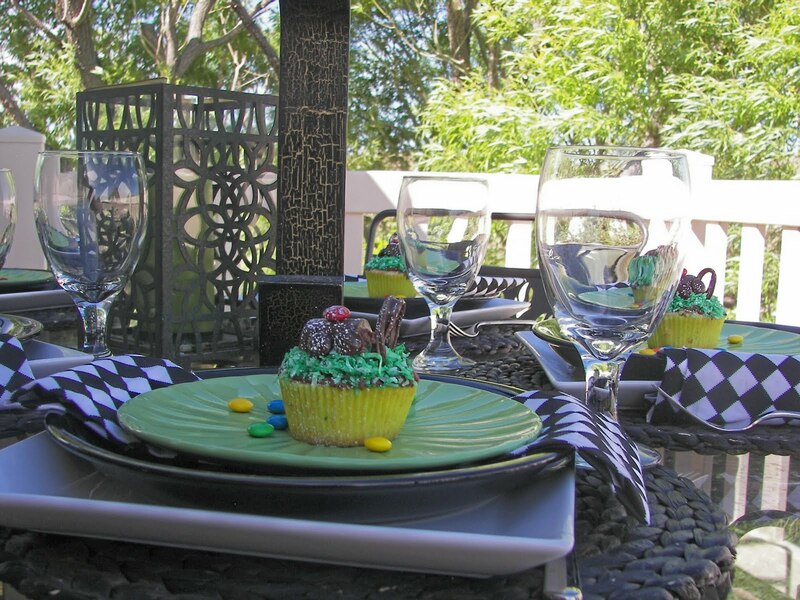 I also love the outdoor setting -- the black and white with green looks sharp! I know your husband will appreciate your efforts! Your Father's Day tablescape is great. I love the colors and the cute cupcakes. How funny, I did not cupcakes last year and am trying to find something for this year. I may just do them again. Your table is wonderful. I love those B&W napkins -- very Father's Dayish. Cuuute cupcakes!! Love the tablescape-where do you store all your different dishes and linens though? Your cupcakes are adorable!!! How clever! Tre cute! Does he still pull Skyler like that?!! Hope you don't cry when you read my Father's Day post. I read it to Kirk and I cried while reading it. Luv ya. Thanks for all your help and inspiration. I think I am having fun. 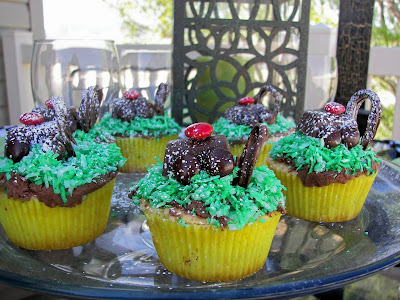 Lawn mower cupcakes..so unique, a great idea! Your table is so much fun! Cute tablescape and those cupcakes are just darling! Love the picture of your hubby and son -- so sweet. I love your father's day table...the cupcakes are adorable! What fun for Dad and all his gang! 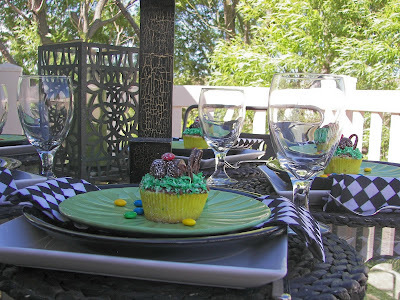 Your table is perfect for guys, not too cute and great colors and the cupcakes get the job done...thanks for a festive idea! Your cupcakes are so cute! I like the color combination that you used. What cute little cupcakes for a very deserving dad. Thanks for sharing! Great article thanks. I really enjoy reading your blog. Such a cool idea with the lawnmower cupcakes! And I have that letter, except ours is a big J. Thats a great start for a centerpiece (the wheels are turning in my head already). Thanks for sharing...great job! Perfect 'scape for Father's Day and how wonderful that you make your hubby's favourites to go with it! 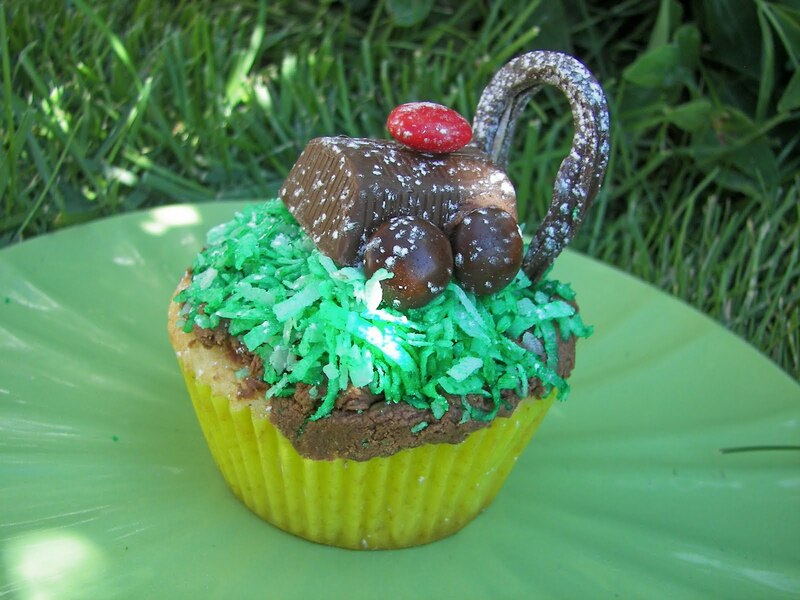 Those lawnmower cupcakes are such a great idea! Your hubby must have been in great shape back in the days of pulling kids behind him while mowing...or does he still do that? I agree with everyone about the cupcakes - how cool!!! That pic of your husband pulling Skyler on his big wheel - my kids used to love their big wheels - I bet he had a blast!!!! Really nice idea, this cupcakes, He will love them. And your kids, too. Thank you for sharing your tablescape. Great tablescape for the man in your house. The cupcakes are too cute! Thanks for sharing and have a great day. Great tribute to the men in your life! those cupcakes are too cute. I love mowing the lawn at my house-great exercise. thanks for sharing with us this week! Very cute! I just love those cupcakes! They are cute as can be. 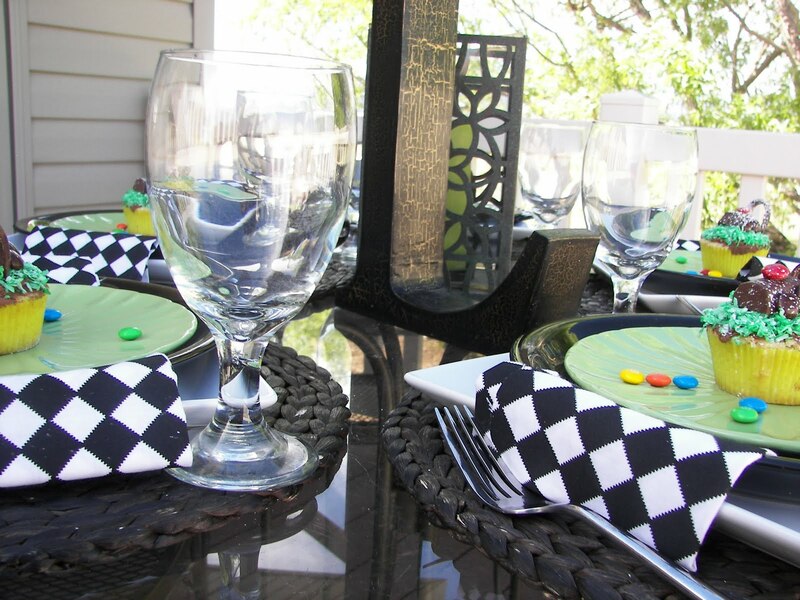 Love your black and white napkins too! Your hubs is going to love it! Clever idea! Your table looks fresh and crisp, very inviting. That's a great picture of your husband and Skylar! Obviously Dad deserves the special treatment you'll be giving him on his special day! Hi Joni! I really like your tablesetting, The placemats and napkins look great together and the salad plates add a pop of color. The cupcakes are adorable! Love the photo of your husband and Skylar!